Have you ever looked at kids playing in a ball pit and just wanted to jump in (if it weren’t for the risk of suspect food scraps, random odd socks and manky Band-aids)? Well, why should kids have all the fun? 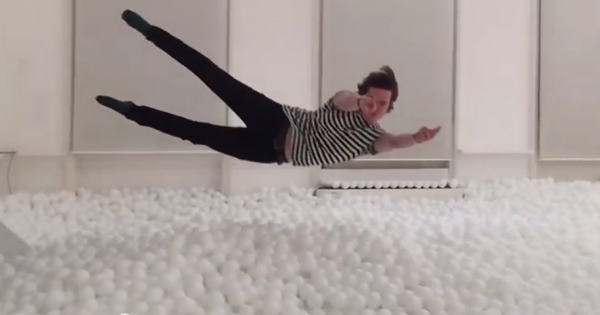 Grown-ups in London are being given the chance to take a leap back in time in a ball pit specifically designed for adults. Creative agency Pearlfisher filled a pit with 81,000 balls at its gallery in Hammersmith to “promote the transformative power of play”. It’s for a good cause, too – people are asked to donate to charity Right to Play, which helps improve education, health and communities for disadvantaged children. And plenty of adults have jumped at the offer to relive their youths for an hour or so – the sessions are already booked out (though Pearlfisher is still taking expressions of interest for future ball pits after this one closes on February 13). If you’re nowhere near London or not lucky enough to have scored a spot in this pit, maybe it’s something you could try at home. Check out our post from last month on a prankster dad who turned his entire living room into a giant ball pit.